Cookie Chanel has opened her own vintage clothing boutique, It’s Vintage, Y’All, in the charming town of Sugar Creek, Georgia. Always on the lookout for stylish second-hand steals, she attends the estate sale of deceased socialite Charlotte Meadows. 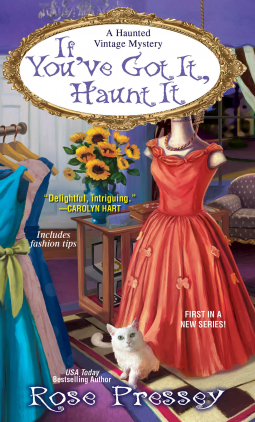 But she gets a lot more than she bargained for when Charlotte’s ghost appears before her—offering fashion advice and begging Cookie to find out who murdered her. As the persistent poltergeist tags along and a possibly psychic pussycat moves into the shop, Cookie sorts through racks of suspects to see who may be hiding some skeletons in the closet. Do a clothing store owner and a disembodied socialite have a ghost of a chance of collaring a killer—or will Cookie’s life be the next one hanging by a thread? What I Say.....This was a cute, quick read. Cookie is a clothes shop owner who suddenly finds herself saddled with a pesky ghost, the kind that aren't going to go away until you do what they want. But this ghost isn't scary, just pushy, and she wants to know who killed her. The story moved along at a quick pace, but it seemed like a first novel for the author, although when I checked Goodreads, she has written quite a few books. I think the parts that weren't as attention grabbing were Heather's Tips (for getting rid of a ghost), the tips didn't seem to really flow with the story, and the vintage dressing tips were pretty basic. The motive for Charlotte's murder seemed strangely anti-climatic, I felt like the book was just ending, rather than a mystery being solved. I'd definitely read another book in this series, just so I can find out about the cat! To have a beautiful, long haired cat walk into your shop is strange enough, but when it starts talking to you via a Ouija board, there's got to be a story there! !